One of the largest single expenditures in running a car is fuel, and great savings in motoring costs are made by reducing fuel consumption. This means adopting a driving technique that minimizes the amount of accelerating and heavy braking you have to do. Driving for economy is all about sustaining momentum building up speed steadily and trying not to lose it. The actual running costs of a car are taken up by fuel, tyres, servicing and repairs. Fuel accounts for more than three-quarters of the running cost, servicing and repairs about a sixth of the fuel bill. 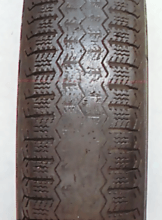 Only a very small part of the total running cost budget is taken by tyre wear. On the level, a car runs most economically at a constant speed, achieved by holding the accelerator pedal in a steady position. This style of driving, where it is possible, can result in the almost unbelievably high steady-speed fuel-consumption figures often quoted by car manufacturers. Modern driving conditions, however, often make it impossible to maintain constant speeds - even on motorways. Where you are forced to slow down, try to work out in advance just how fast you will need to be going when you reach whatever is causing you to reduce speed. Then you can ease off the power and let the engine slow the car down gradually rather than having to brake at the last minute. Apart from being economical, this style of driving reduces wear on brakes and tyres, puts less strain on the car, and is less unnerving for other road-users. To accelerate a certain vehicle to a certain speed takes roughly the same amount of fuel, however quickly you do it. The main difference is that if you accelerate quickly you will be at the faster (and less economical) speed range for slightly longer, so you'll burn fractionally more fuel. The main thing to avoid is fluctuating movements of the throttle, because every depression of the pedal means the accelerator pump is squirting more fuel into the engine. It's best, for example, to drop a gear to pick up speed rather than just to push the pedal further. There is no specific law that requires drivers to keep the car in gear at all times. In the early days of motoring, brakes were often inadequate and using the engine to slow the car through the transmission was essential. But with modern cars, these constraints do not apply. Brakes are now more effective and largely fade-free, and if you do need to re-engage a gear, synchromesh makes this possible. Some drivers freewheel to save fuel, but you still need to keep the engine running to keep the brake system's vacuum servo energized and, in any case, turning off the ignition will usually lock the steering. It's very unwise to do this on a steep hill. Fuel consumption is at its lowest when the car is in the highest gear it can comfortably manage on a small throttle opening - technically this means when the engine is running at a speed near to its peak torque level. If you race the engine it will burn a lot more fuel without doing much more work. It's better to change up early. This doesn't mean, however, that you should always drive up hills in top gear because you'll need a large throttle opening to keep going, which will again cost fuel. advantage by making the downward slope on the other side work for you. Gaining speed when you're travelling down a hill needs less fuel because gravity will be helping the engine to accelerate the car. A slightly varying speed, falling back a little when climbing and building speed back up on the descent, is more economical than just forcing the car to maintain the same speed regardless of gradient. This technique is most useful on clear motorways as speeds are likely to be more constant for longer periods. When climbing steeper hills, change down before the engine labours so that you can maintain speed on a small throttle opening. If you have a rev counter try to stay in the 2000 to 2500 rev range; neither 1200-1400rpm nor speeds above 4000rpm are economical.